Chilli rating - med - 2. Real Thai. Just add meat or veg. Ready in 15 mins. Gluten free. No MSG. No artificial colours, flavourings or preservatives. Suitable for vegetarians & vegans.The most classic and favourite of Thai curries with a fresh, tangy and aromatic flavour. 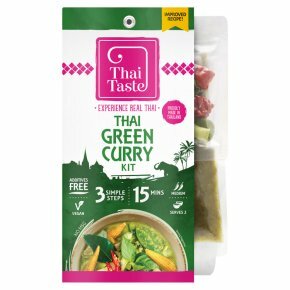 Ideal with any type of meat or vegetable, our authentic green curry kit is made in Thailand with fresh ingredients, including green chilli, lemongrass, black ginger, galangal and kaffier lime peel. Not suitable for microwave cooking. Handy Tips Also delicious with, prawns, chopped vegetables, or whatever you have in the fridge! You can make the dish hotter by adding sliced green chillies.